Since the uncontrolled logging of rosewood for export mostly to China began in the Upper West Region of Ghana some three years ago, the impact is being felt in the mostly farming communities. Communities have started reporting erratic rainfall patterns, storms, poor harvests and bushfires. “Here we don’t have the rules that govern concessions, where one can only harvest wood from allocated concessions like in other parts of Ghana where timber is harvested. In this area, people harvest whatever, and wherever they can find rosewood,” says Michael Asante a small-scale timber harvester operating in the Upper West Region of Ghana. There is currently a ban on felling rosewood trees in the region, but there is evidence the law is being violated – fresh trees are being cut, and not many offenders are facing the law. Asante who says he has been in the timber business for more than 10 years, believes that at the current rate of harvesting, rosewood will be gone from the region in three years, and he has a plan ‘B’. “I will move to other tree species or go into stone quarry,” he beams. In Ghana, however, timber resource allocation and harvesting are regulated by the Timber Resources Management Act, Act 547 of 1998 and the related Regulation LI 1649 of 1999. For Rosewood, however, the issuance of permit to contractors prior to exploitation and monitoring exploitation once the permit has been issued has been the main regulatory mechanism since the surge in its export, the Forestry Commission says. Illiasu Tafa, the Assemblyman of the Kassana and Chinchan electoral area near Tumu, who is also a farmer, says they haven’t been having good rains since the logging began some three years ago and peaked. “The Chinese are cutting fresh trees, we are not happy, but we can’t stop them. We even fear future generations will lose out as a result,” he says. Another farmer in the community, Shaibu Seidu in his early 30s who in the past had mobilized the youth of the community to resist the logging said they failed to stop the logging because they didn’t get the support of their leaders. “We mobilized, got the assistance of the police and went into the bush to drive out the loggers, but we didn’t get the support of our leaders,” he added. Seidu said they used rosewood leaves as fodder to feed their livestock, but that has become scarce now because of the massive logging. “We walk for miles to find fodder for our livestock,” says Yusif Kodimah, another farmer. “Because of the presence of the rosewood merchants, tractor owners don’t work for farmers any more. The rosewood merchants pay more and so they choose to convey logs, rather than work on farmlands,” Kodimah added. The competition favours the wood merchants because they are paying GH¢2000 per load while farmers pay GH¢90 per farm unit ploughed. Another farmer who owns a tractor, Fuseini Kanton, says however, that he has turned down offers from the merchants to rent his tractor. “I refused to rent my tractor to them to convey rosewood, I don’t support their activities,” he said. But as the activities of the loggers intensify, farmlands have become vulnerable to other forms of risks – including invasion by cattle herders looking to feed their herds. “We are forced to keep vigil on our farms to keep away the cattle that come to feed on our maize because they can’t find rosewood leaves to feed on,” Kodimah said. The farmers also shared frustrations about abandoned rosewood branches causing fires on their farms. The Upper West Regional Director of the Environmental Protection Agency (EPA) Mrs Zenabu Wasai-King has been reported in the news saying bushfires have reduced soil fertility, destroyed farm produce, lowered general agriculture and therefore threatening food security in the region. “As they drag the felled logs on our farms, the effect loosens the soil and causes flooding anytime it rains,” Kanton said. Kanton and his colleague farmers in Tumu say they have noticed that since the logging intensified, the rainfall pattern has changed. “Rainfall has become erratic, topsoil and nutrients in the soil are being washed away and gullies are developing on our farms as a result of the activities of loggers. 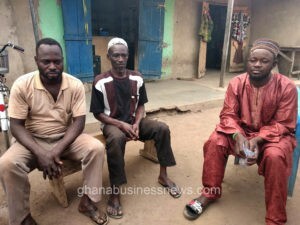 Now one has to apply lots of fertilizer to crops,” Yusif lamented. Farmers and their crops don’t also have shades when the sun is hot and blazing. “Our crops have no shades anymore, and when the sun is hot, we farmers, can’t find shades to shelter from the heat,” says Siita Adama. The massive logging has led to loss of trees that otherwise were serving as windbreaks. With the rosewood gone, the village of Tokali is now exposed to storms. To ascertain the complaints about rainfall patterns, ghanabusinessnews.com obtained rainfall data from the Ghana Meteorological Agency and analysed it. While Meteorologists say the massive logging in the region might not necessarily impact rainfall patterns in the area, they did state that it is a possibility. 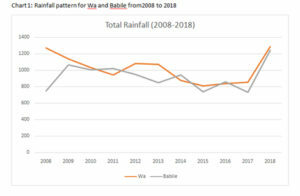 The 10-year data shows that between 2014 and 2017 there has been a decrease in the amount of rainfall in Wa and Babile – Babile is the town closest to Tumu. The Agency doesn’t have a station at Tumu, and so we used the data from Babile. 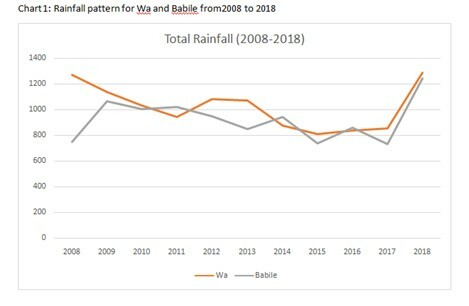 Between 2008 and 2013, Wa recorded more than 1000 milliliters of rain, but from 2014 to 2017, the rainfall volume decreased to average 850 milliliters. It however increased to above 1200 in 2018. Villagers in Tokali also say the rains when they do come sometimes cause floods in their farms. This claim was corroborated by all the other farmers in the other communities. The Chinese have always been in Ghana. But their presence was hardly felt beyond Chinese movies, until they got involved in natural resource exploitation – the involvement of the Chinese in illegal gold mining in Ghana is well documented. Until they started exploiting rosewood, local people knew nothing about the export value of the tree. Locally, rosewood is known as Krayie/Kpatro, the name commonly used for the exploited timber from the species Pterocarpus erinaceus belonging to the family – Fabaceae– Papilionoideae. The Chinese buyers refer to it as Kosso. Traditionally, local people used it in the production of high quality charcoal and for building their homes. Rosewood occurs in six regions of Ghana – namely Ashanti, Brong Ahafo, Northern, Volta, Upper East and Upper West regions. But the story of rosewood in the country dramatically changed when on April 19, 2007 Ghana signed a deal with the Chinese government to build the 400MW Bui hydropower dam in the Brong Ahafo Region. 500 Chinese workers arrived in Ghana to start construction of the dam in December 2009. To clear the area for the dam, the government permitted the removal of trees, including economic trees, and that was when the Chinese found the rosewood species and began exploiting them for export to China. While there are no official figures, the number of Chinese citizens in Ghana’s Upper West Region at any point in time is estimated around 150. Local people say they are financing and supplying chainsaw machines and other wood processing equipment for local tree hunters. The exploitation of rosewood happens across West Africa. Records of a Briefing for the 66th meeting of the Convention on International Trade in Endangered Species of Wild Fauna and Flora (CITES) standing committee in January 2016 stated that a year-by-year comparison of Chinese import data indicates that West Africa has experienced a wave of boom-and bust Hongmu (rare and valuable “red wood” used primarily for antique-style furniture in China) trade cycles. The first country affected by increased rosewood exploitation was Gambia (2011-12), followed by Benin (2012-13) and Côte d’Ivoire (2013-14), Ghana (2013-14) and Nigeria (2014-15). Hongmu exports from West Africa have grown more than 1,000 fold between 2010 and 2015. West Africa is now the world’s leading hongmu-producing region by volume. The main species is Pterocarpus erinaceus, known as “Kosso,” found in the dry forests of West Africa, where the unsustainable harvest increases the risk of desertification. In Senegal’s Casamance region, the rosewood trade has fueled rebel activities through the smuggling of Kosso to neighboring Gambia. According to the Environmental Investigation Agency, the expanding trade has driven successive boom and bust cycles all over the world, marked by unsustainable harvest, multiple legal violations (theft, smuggling, corruption), and violence in source countries. As it decimates native stocks of rare and valuable species across the tropics at an unprecedented rate, this trade represents a challenge for the CITES and its Parties. The hongmu industry has expanded massively over the past decade. Hongmu log imports into China have increased by 1,300 per cent from 2009 to 2014, accounting on average for 10 per cent of Chinese log imports by value from 2009 to 2015. China’s hongmu industry is composed of 30,000 companies generating domestic retail revenues of over $25 billion, and has benefited from generous government incentives. Demand for rosewood in China has grown exponentially over the past 15 years, from 144,500 cubic metres imported in 2000 to over two million cubic metres in 2014. After a brief slowdown in 2015, the demand went up once again in 2016 despite a general economic slowdown in China and the government’s anticorruption campaign. Logs, which provide little value-added in source countries, account for approximately 80 per cent of overall hongmu imports. During the first half of 2016, China imported on average the equivalent of 350 hongmu logs per hour. The Agency’s data shows that Ghana is the second largest source of rosewood to China in West Africa, after Nigeria. China’s lust for natural resources in developing countries is well documented, the Chinese are known to have literally invaded Ghana and then unleashed ferociously an unprecedented wave of uncontrolled illegal mining in the country, digging for gold and polluting water bodies around the country. 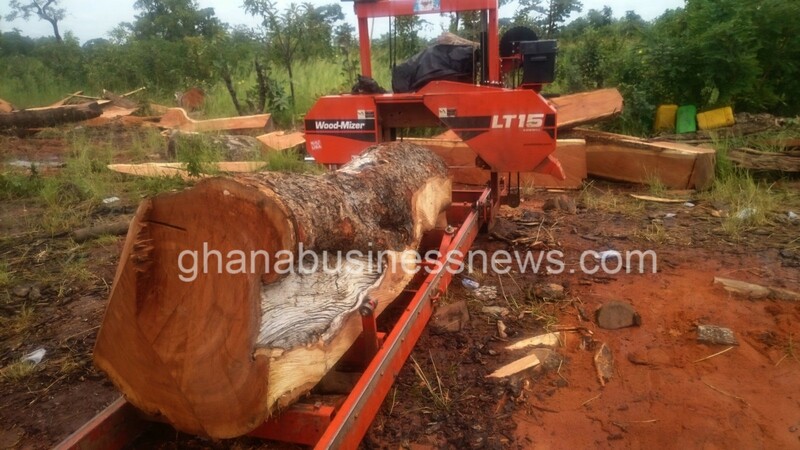 What is yet unknown to many Ghanaians is the invasion of the savannah woodlands in search of and harvesting of rosewood – particularly in the poorest region in the country – the Upper West Region. Available data from the Forestry Commission shows that by the year 2013 the volume of rosewood exports from Ghana rose to 40,999 cubic meters from 125 cubic metres in 2005, with China alone being the leading importer. The data shows that in 2011, China imported 96 per cent of all rosewood produced in Ghana. China imported 3,611 cubic meters of the total 4000 cubic metres of rosewood produced in Ghana. The Commission’s 2017 data shows that two companies, one of them a company with a Chinese name were the only two on record to have exported rosewood to China. Time Concepts Ghana Limited exported a total 397.364 cubic metres and Dong Li Trading Company Limited, also exported the same amount of rosewood to China. The exports earned the country a total of €505,447.00. The unrestrained harvesting of rosewood and the obvious impact it potentially has on the fragile ecology of especially the savannah regions of the country compelled the government to ban the harvesting of the species. Already, there have been five bans. But soon, an excuse was found to lift the bans at each point. Since the lifting of the ban, rosewood exports from Ghana have spiked, making rosewood the second highest volume of wood species exported from Ghana after teak, according to data from the Timber Industry Development Division of the Forestry Commission. In the Upper West Region however, since July 2017 a ban on rosewood harvesting has been in force. But it doesn’t appear to be fully enforced. The excuse to “collect lying and confiscated wood is being used to fell trees that are later passed as lying wood,” says Salifu Issifu Kanton, the Executive Director of Community Development Alliance, Ghana and resident of Wa. 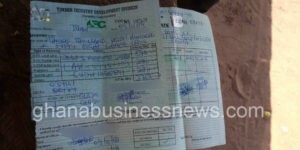 A contractor who has been licensed to only ‘collect’ also tells ghanabusinessnews.com that more than collection is being done, as some contractors, he claims, who are licensed to only collect are cutting fresh trees. 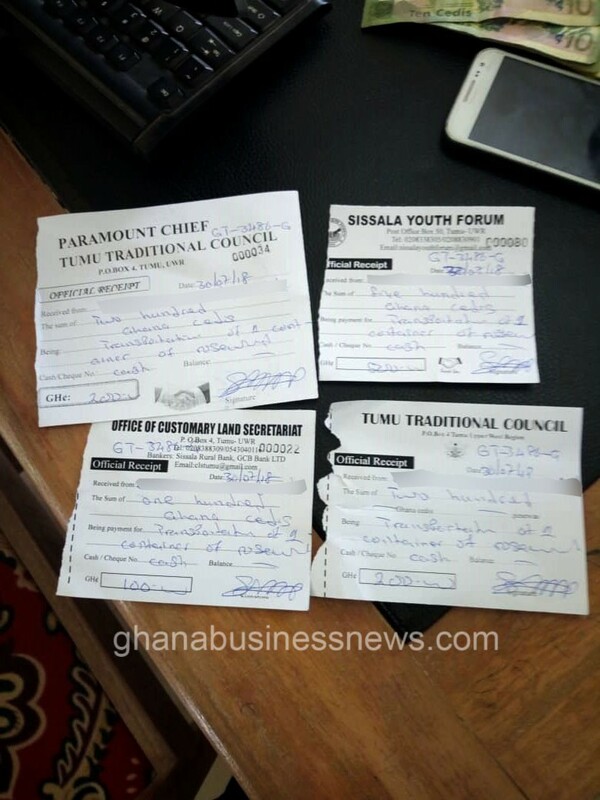 Michael Asante, whose company, Lord of Kings is licensed to do only “collection”, says only four companies have been licensed to ‘collect’ rosewood in the Bulenga community, a community of some 4800 people near the Upper West Regional capital of Wa. But when he was asked about rosewood, Suglo said they have only few and even those are being cut. Asked who are cutting the trees, he said he doesn’t know because he is not involved. “We didn’t know about rosewood, until the companies came around in 2016 and said they have permits to harvest them,” he said. Asked if he has seen what the permits authorize the companies to do, Suglo said he hasn’t seen the permits. “Because I am not involved, I don’t know,” he said. But he went on to say some communities are allowing the companies to fell rosewood. “In 2016, the timber companies came around and claimed they have permits to fell the trees, but I haven’t seen any permit myself,” he adds, while pointing out that some communities are allowing uncontrolled felling of rosewood, but because he is not involved, he doesn’t know the extent, but he is aware of the consequences of the indiscriminate tree felling. “Some of us are worried about the effect on rain patterns; we also fear our children will grow and not get to see these tree species. We also used them to roof our houses, but now not easy to find,” he said. According to Suglo, his efforts to know which companies are involved in the tree felling and calls on the authorities to stop giving out permits have been unsuccessful. “The community is not benefitting; only individuals are benefitting from the activities. If they want community involvement, they should involve us,” he says. 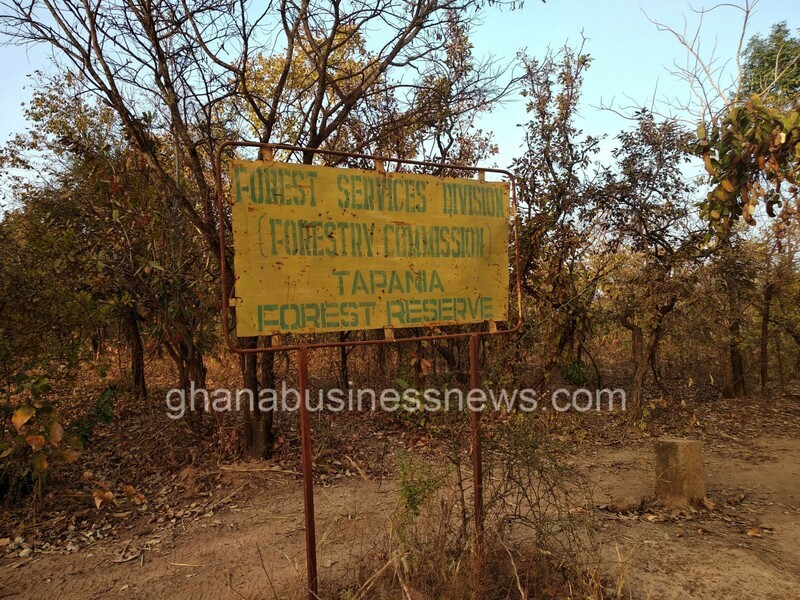 According to Kanton, 23,000 rosewood trees have been felled, but the Upper West Regional Manager of the Forestry Commission, Isaac Adonteng disagrees. Interviewing Adonteng while posing as an independent researcher in forestry, because public officials won’t very often speak freely to journalists on matters of public interest, he said harvesting of rosewood in the region is being done at sustainable levels. “The reserves are not at risk,” he said. He adds that it is rather population expansion, demand and fires off the reserves on farmlands that are the causes of deforestation,” he said. He points out that charcoal production for commercial exports is also contributing to deforestation. Adonten said the ban on rosewood is still in force. But he accused local people of hiding behind farming activities to fell rosewood trees. In September 2017, the Upper West Regional Security Council cancelled the permits of 24 companies licensed to salvage rosewood when it was found that they were cutting down trees. While the Upper West Region is losing its resource of rosewood trees to China, it has little to show for it. It is still the poorest region in Ghana. The Upper West region is the poorest in Ghana, and has very little to show for feeding China’s insatiable desire for rosewood. Rosewood exports from Ghana didn’t start until 2005, and exports have surged since then, largely driven by demand from India and China, and the Upper West Region is contributing some of its rosewood. According to the Ghana Living Standards Survey Round 6, the incidence of poverty and poverty gap are not evenly distributed in the country’s administrative regions. The Greater Accra has a very low level (5.6 per cent) of poverty incidence, which is 18.6 percentage points lower than the national rate of poverty. The three northern regions, which comprise mainly savannah areas have very different levels of poverty incidence. “More than four in every ten persons are poor in Upper East (44.4 per cent), increasing to one in every two in the Northern region (50.4 per cent) and seven out of every ten in Upper West (70.7 per cent),” it says. Documents obtained by ghanabusinessnews.com, shows that between February and April 2018, 12 companies using a total of 173 trucks have collected 5.4 million cubic metres of rosewood, earning the state stumpage revenue of GH¢649,200. While this shows official government revenue from rosewood harvesting, ghanabusinessnews.com obtained receipts showing that local traditional authorities and youth organisations earn revenue from the loggers. 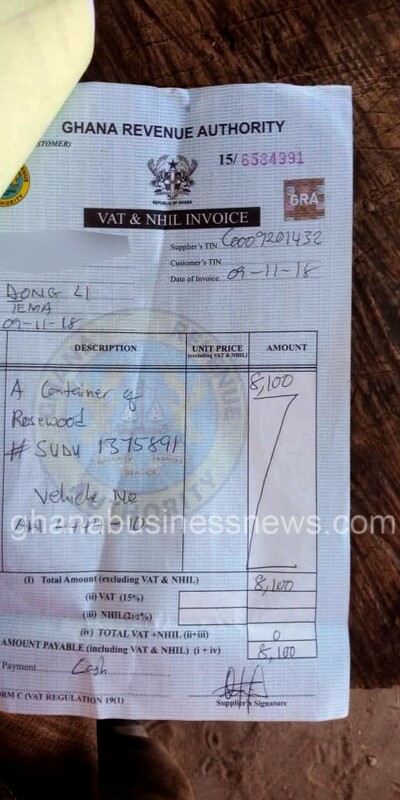 They charge fees to allow the loggers to move the harvested woods to Ghana’s port of Tema. Inquiries from the Regional Coordinating Council however indicated that the practice by the local authorities is unlawful. The receipts from youth organisations and traditional authorities, serve as a licence to move illegally felled wood out of the region to the ports for export. The huge revenue derived from the trade by the state seems to account for the lukewarm attitude of public officials in enforcing the ban on rosewood harvesting which is still in force in the Upper West Region. While action has been taken in some instances, there is a general lack of enthusiasm in curbing illegal logging of rosewood. Court documents obtained by ghanabusinessnews.com show that five persons engaged in illegal logging were arrested and arraigned before court. 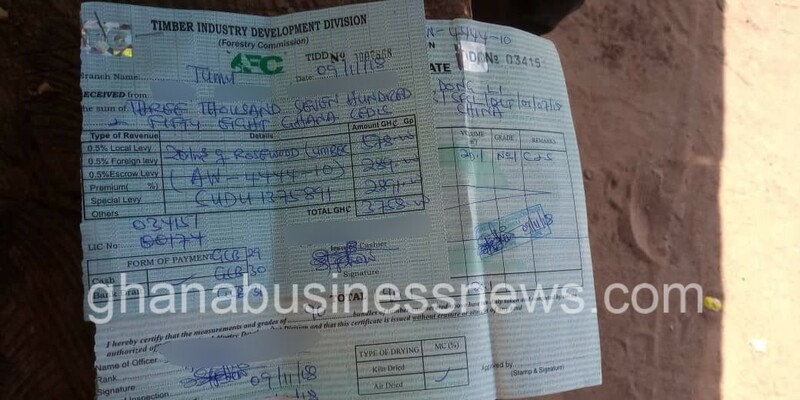 They all pleaded guilty and were sentenced to various fines by the Tumu District Magistrate Court as at November 2018. Mr. Moses Luri, the Executive Director of the CSO, Social Initiative for Literacy and Development Programme (SILDEP) believes that the Forestry Commission knows there are no woods lying in the forests to be salvaged and yet it continues to issue permits to companies to salvage them. Luri argues that government is motivated by the revenue from the rosewood business to look the other way. He however suggests that the government should promote rosewood seed and treat the resource just as it treats cocoa. 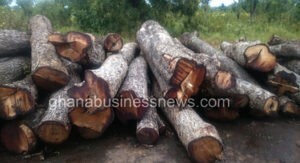 Officials of the Regional Coordinating Council who say they were not authorized to speak on the matter and therefore wouldn’t go on the record, confirmed that the loggers come to the area with permits from the Forestry Commission Head Office in the country’s capital, Accra, claiming they are authorized to collect, but they end up cutting and “there is little we can do,” the officials said. When ghanabusinessnews.com reached out to the CEO of the Forestry Commission, Mr. Owusu Afriyie, also known as ‘Sir John’ in political cycles by phone and text messages, he did not respond to a request to hear their side of the story. “These areas are the food basket of the region, because they have some improved vegetation. These are the areas with some tree cover – rosewood. But now the rosewood is being completely cut, and they are even moving to other tree species including one known as pauper,” says Issifu Kanton. Even though Kanton, says advocacy has been going on, he thinks the lack of political will has slowed down acts to stop the indiscriminate felling of the rosewood. During long treks through farms, we discovered freshly cut rosewood waiting to be moved, and stumps of freshly cut wood. Some can’t be exported or used because they are not matured and others have hollows – timber companies leave them rotting on operation sites. Local people are allowed to collect some to produce charcoal. The Tapania Forest Reserve near Tumu hasn’t been spared. Despite a sign saying Tapania Forest Reserve, loggers have invaded the forest and cut as many matured rosewood trees in sight. In the middle of the reserve are scattered rosewood stumps. Senegal and Nigeria, in responses to the indiscriminate felling and export of rosewood in these countries have worked to get rosewood included in CITES. Nigeria, for instance, through CITES has suspended trade in rosewood. 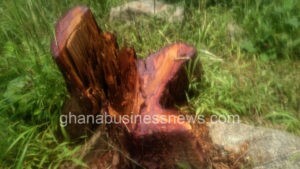 Ghanaian authorities have said a number of times that as a medium term measure to control further harvesting of rosewood, arrangements were being made in collaboration with CITES and civil society organisations to introduce a quota system that will regulate how much rosewood was exploited at a given time. Authorities also say a policy on Tree Tenure and Benefit sharing for trees outside the forest was being discussed to motivate farmers to resist the illegal exploitation of rosewood and other tree resources on their farms and to stop speculative felling by illegal loggers. While authorities tinker around for a pragmatic response, it appears the harvesting of rosewood, especially in the fragile ecological zones of the Upper West will continue. All rights reserved. This report or any portion thereof may not be reproduced or used in any manner whatsoever without the express written permission of the publisher except for the use of brief quotations in reviews. This investigation by ghanabusinessnews.com was made possible with a reporting grant from the International Centre for Investigative Reporting and FORD Foundation.